The Know Speak English Foundation presents this Interactive, Exciting and Fun game to challenge and improve your knowledge and usage of the English language. There are questions on the nine components of grammar, questions on the usage of phrases and idioms and questions on vocabulary. 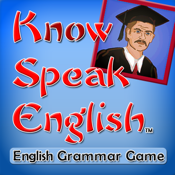 In KSE Free there are only 3 questions per grammar tile, the full version of Know Speak English has a total of more than 2000 questions to help you understand the beauty and the richness of the language. Based on cognitive learning methods the full version of Know Speak English offers the player four choices of play starting with the easy Beginners level and progressing through the Intermediate and Advanced levels and culminating in the General level. The challenge is to finish the level that you choose in the fastest possible time and accumulate the most points. All levels have different time allocations so the player has to beat the clock to score. There is a leaderboard to record your score and challenge your friends and relatives to better it.